As I navigate the virtual highways and backroads of the interwebs, I am always searching for new content that interests me. In this blog, I wanted share some recent articles related to Cloud adoption. Amazon AWS is approaching $10 billion annual revenue, Microsoft Azure is approaching $3 billion annual revenue, Oracle Cloud is positioning themselves as THE enterprise cloud for customers. When a virtualization giant like VMware and a cloud giant like AWS partner at an engineering level to deliver VMware on AWS bare metal, so that customers can have a seamless hybrid cloud experience, you know hybrid cloud model is for real. If you’re looking to transform your business, look no further than the hybrid cloud. Pursuing a hybrid cloud strategy combines the computing control brought by a private cloud, with the flexibility achieved by the public cloud. The benefits to your business that can be derived from building a hybrid cloud depends on the amount of time and effort you put into designing, building, implementing, and monitoring your solution. Over the last several years, the clouds have rolled in over enterprise IT. These clouds aren’t dark ones obscuring the sun, however; in fact they’ve made the enterprise computing horizon much brighter. Going from a relatively unheard-of concept ten years ago, the cloud has become a popular buzzword seizing hold of the collective conscious of CIOs and directors of IT at companies across industries, sizes, and revenues for its promise of organizational transformation. At roughly $80 billion in annual spending, the US Federal Government is the world’s largest consumer of information technology. That budget funds pervasive IT use across hundreds of agencies (nobody is certain how many). To better manage the extraordinary costs, in December 2014 Congress enacted the Federal Information Technology Acquisition Reform Act (FITARA). This isn't their first attempt at control. Back in 1996, there was the Clinger–Cohen Act (CCA), formerly the Information Technology Management Reform (ITMRA), that was intended to improve federal government acquisition, use, and disposal of IT resources. And of course, in 2010, there was the Federal Data Center Consolidation Initiative (FDCCI) started by the Information Officers Council (IOC) and later merged with PortfolioStat. 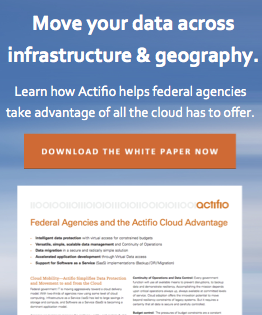 Unauthorized use of public cloud services is a contentious issue we encounter as we design the initial Actifio architecture for new clients. Every CIO faces it, and most are scratching their heads about how to address it. One recent example is a large North American enterprise with locations spread across 50 states, Mexico, and Canada. This company is highly dependent on sophisticated central IT services. No surprise that financial controls, operational management, information security and IP protection are all of primary importance.